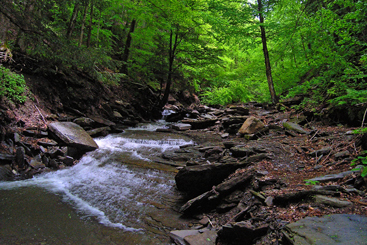 Upper and Lower County Line Falls are located in the Hemlock-Canadice State Forest which covers 6,684 acres. The area contains the two undeveloped Finger Lakes, Hemlock and Candice. They are the primary source of drinking water for the City of Rochester. Activities in Hemlock-Canadice State Forest are subject to New York State Department of Environmental Conservation Rules and Regulations. They allow many recreational activities but prohibit uses that could threaten water quality of the streams and lakes within the area. Please remember that this is a very sensitive area because it provides public drinking water and act responsibly. Also please respect all posted boundary lines. Location: The parking area for Reynolds Gully is located a little over 2.2 miles north of Springwater, New York. Starting from Springwater follow Route 15A north for 2.2 miles and turn right (east) into a dirt parking area. I found Reynolds Gully to be a challenging creekwalk. Slippery rocks and fallen trees require you to use extra caution. Public land ends about 800 feet upstream of Route 15A. To enter the privately owned land beyond this point requires the permission from the landowners. Please do not enter private land without permission. From the parking area follow a trail to the east that parallels Reynolds Creek. The trail soon ends at the creek and you'll begin your upstream creekwalk of this very challenging gully. Hiking in the gully can be difficult. The rocks in the creekbed are loose or very slippery. Take your time and be sure of your footing. There may be downed trees to climb over. The creek water is quite cold even in the hottest days of summer. As you proceed upstream you will pass several small drops and cascades. Soon you will come to a little 3 foot high by 10 foot wide waterfall. 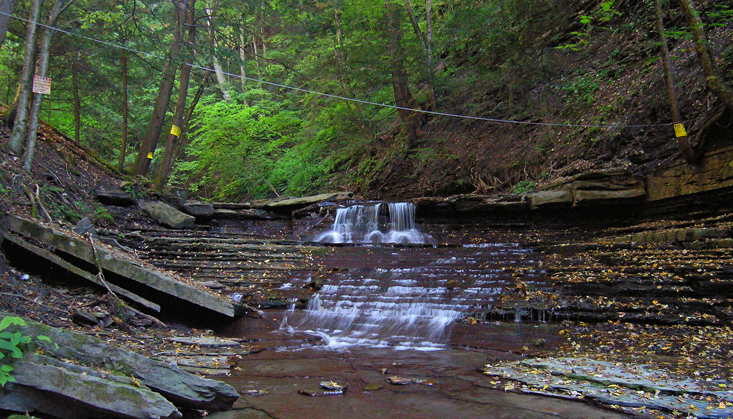 In times of low water the falls is broken into two sections, as seen in the photo above. The creekbed just before the falls is a large very flat section of bedrock. The cap rock of this falls has created an interesting overhang a short distance downstream of the falls. To continue your creekwalk you will have to find a way to climb this falls. In a short distance, after rounding a slight bend in the creek, the last publicly viewable waterfall in Reynolds Gully will come into view. Note the four "Posted" signs in the above photo. This waterfall starts with a 3 foot high falls and is followed by a cascade with a 6 foot drop. 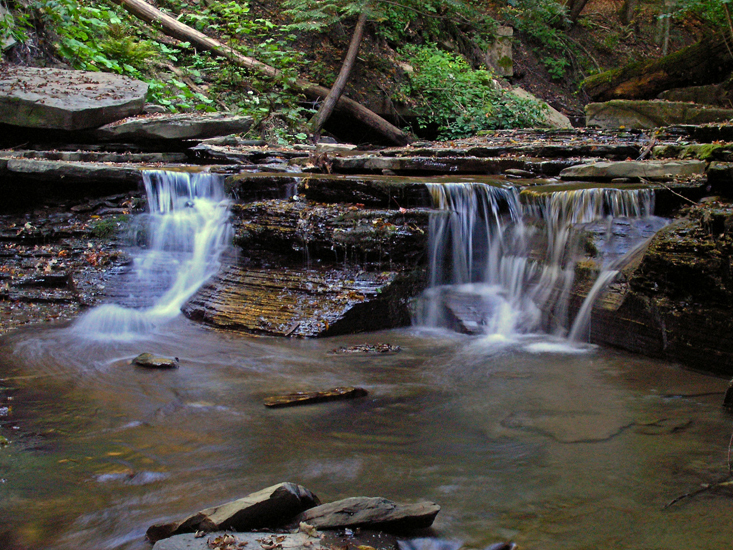 The creek bed at the crest of this waterfall is 27 feet wide. The falls faces to the north northwest. This is as far as you can legally creekwalk on public land. 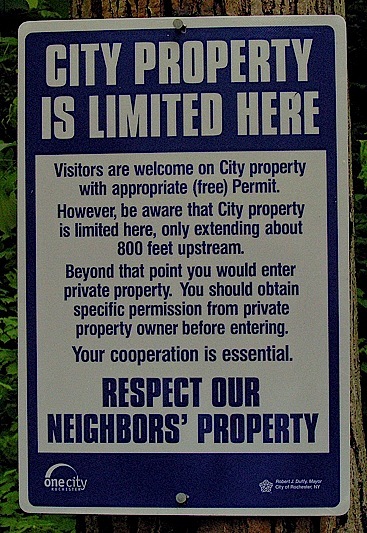 To continue you must have permission from the private property landowners.